1 image. 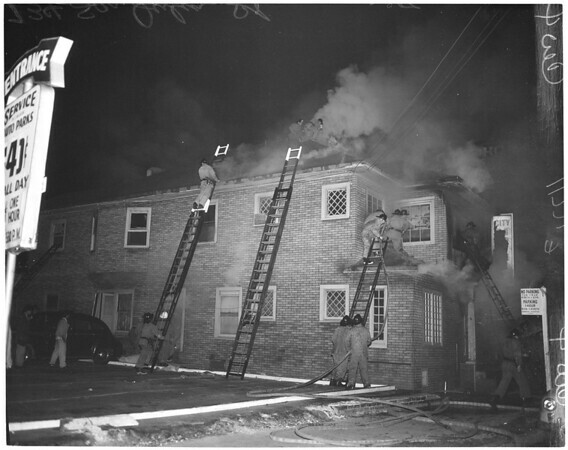 Fire in house at 734 San Julian Street, 27 March 1956. General view of firemen rushing up ladders alongside house. Caption slip reads: "Photographer: Wesselmann. Date: 1956-03-27. Reporter: Parks. Assignment: Fire in house at 734 San Julian St. 4: Firemen rush up ladders alongside house at 734 San Julian Street, where fire dept. spokesman said blaze was started by a roomer smoking in bed."